The Swift 1805 Pilot Boat (my first ship model) was actually started in 1984, set aside, finally completed in 2004.) . . .
An album of pictures of my progress building the kit. 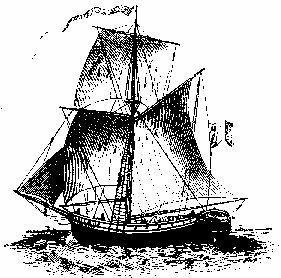 The Halifax is discussed in: Howard J. Chapelle's The Search for Speed Under Sail, his The History of American Sailing Ships, as well as in Harold M. Hahn's The Colonial Schooner 1763-1765. Awaiting their turns at Eldrbarry's Dockyard . . .
Sea Tale Books has a wide selection of Nautical Books including ship modelling books. Seaways publishes Ships in Scale Magazine and also has CD's available of past issues and with scratchbuilding plans. Model Ship World a community of ship and boat modellers from around the world, whose aim is to promote ship & boat modelling of all types. Wood Ship Modelling for Dummies Wooden Ship Modeling: Videos, Technical Notes, FAQ, Tips and Tricks, Glossaries for Building and Improving your Wooden Boat Model. The Schooner Man An extensive site covering a vast variety of Tall Ships and other Nautical interests, with an Alphabetized index at the top. Sea Tale books (Amazon) is a part of this vast site. C. S. Forester's Capt'n Horatio Hornblower captured my imagination as a child; later as an adult I have enjoyed reading many other novels set in the times of the Tall Ships. Among my favorite authors are Alexander Kent, Dudley Pope, Dewey Lambkin, C Northcote Parkinson, Dan Parkinson, and Patrick O'Brian. Here are some links to sites related to these many sea stories. Novels of Nelson's Navy Indexes Authors, Characters, Battles, Etc. Patrick O'Brian: Gunroom Guide . . .
Sea Tale Books has a wide selection of both historical and fictional Books. Dewey Lambkin (with Links to other Nautical Authors at the bottom).